Note: This session the U.S. Supreme Court will be hearing a case about the display of religious symbols, such as the cross, on public lands and property. Given the Establishmenrt Clause this chould be a slam dunk. But remember, this is a court with Justices Scalia, Thomas and Alito, among others. So I am reprising No. 24. 7 from 9.16.2005 for their consideration. The Court might have missed it the first time. I remember when my daughter’s goldfish died. Laura was about eight years old at the time, and when we buried Annabelle (the goldfish)* in the side yard Laura made a little wooden cross out of twigs to stand over the deceased pet’s grave. I had set aside the thought I had at the time—really a question—of how my daughter knew that Annabelle was a Christian (they were close, but I don’t think the matter of religion ever came up between them). It was the same question that also arose in my mind when I used to see those long rows of white crosses at military cemeteries and other Elysian Fields, even ones that said “a soldier known only to God.” Apparently that meant only known to a Christian god. Sure, some cemeteries have markers with a Star of David; but I don’t recall seeing any with a Muslim Crescent, or a (what?) “scarlet A” for atheists. So the default faith for the fallen in our society, whether warrior or goldfish, is apparently to be represented by the white cross. I find that a bit presumptuous. But, of course, it is an extension of that more odious presumption that the white cross represents the faith of American society. I am well on record in these pages with my distaste for the feeble barrier between church and state that is besieged by Christian fundamentalists with a fervor only matched by zealots in other evangelical religions. I am ready to do battle with any mind that claims they can “know God” better than me, and I have contempt for anyone who claims along with their ignorance an equivalent moral or mystical superiority. Ahhh, that felt good, but it is tangential to my theme de jour. Which is . 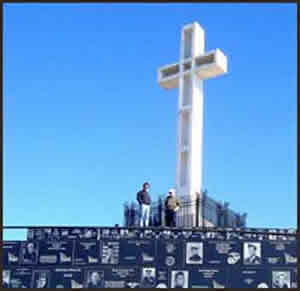 . .
One can only imagine the outrage if someone removed the huge white cross atop San Diego’s Mt. Soledad in the middle of the night. Mind you, there are some of us who want it removed from what is public land. Courts have decreed for years that it must go, but a gutless City government has been complicit with the “Blancocruxians” in measures to keep it there. Meantime, a veterans group has installed a war memorial of sorts around the cross, attempting to fuse the cross and patriotism in a inviolable bond. 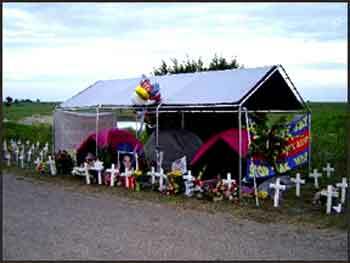 Would they object to removing the cross and keeping the memorial? I don’t think so. And so, after years of litigation the “Blancocruxians” have managed to get the matter on the ballot of a special election to fill the seat of the resigned mayor. Like the flag, the cross has been appropriated by partisan politics, right-wing politics, shoved in the face of the people who are all but expected to be idolatrous of both, to be “good Americans” who presumably go to the right churches on Sunday and support the right politicians who support the right war, which is in part at least a war of the right religion. A Buddhist acquaintance once questioned the logic Christianity by asking why any person would want to go about displaying a symbol (the cross or crucifix) that represented or showed their god being cruelly put to death. It seemed to him to fly in the face of the notion of a god being a superhuman being. The notion of my former theology professor’s concept of Christ’s “death-victory” was something I decided not to inflict upon him in response. But I wonder how those who repose, with appropriateness or irony, under those white crosses feel about all this white cross stuff. If there is indeed a place where they are, and where they can know (if they even care), what do they think of the hypocrisy of things like burning crosses, crosses used for blatant political advantage, crosses that are used to justify war and then mark the graves of dead soldiers, crosses for the fallen that are stolen under the cover of darkness. *Isn’t Goldfish a Jewish name? I don’t think I’ll tell Laura though; it might upset her to learn that Annabelle really sleeps with the loaves.